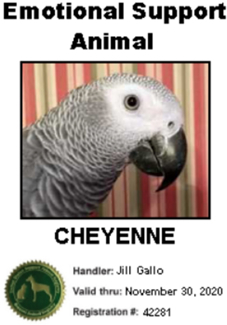 This section about Emotional Support Animals was inspired by Avianweb visitor "Patrice," who also supplied much of the information. Additional data was gathered from relevant Disabled / Government / Carrier resources (as cited or linked). Roles and Benefits of "Emotional Support Animals"
The therapeutic benefits are derived from comfort, companionship, affection, as well as non-judgmental and positive interactions with their owners. Traditionally the roles of "Support Animals" were filled by dogs; but may now extend to other animals as well, including birds and cats, and even miniature horses, pigs, rats, reptiles and other animals that are determined to be able to fill this function. ESAs are officially not categorized as "pets," but are Service Animals with certain rights. To be legally considered an ESA, an animal has to be endorsed or recommended by a patient's physician or other licensed medical professional. This could be achieved through a doctor's prescription or letter (on official stationary) stating that the animal offers therapeutic benefits to the patient. The disclosure of confidential medical information - including, but not limited to, a patient’s diagnosis - is not legally required. Even though Service Animals CAN become licensed or certified, it is not a requirement. They can, but don't have to, wear special collars or harnesses. Disabled individuals are not required to carry documentation with them in order to access public places (such as restaurants, stores, theaters, libraries, sports facilities, etc.) with their Support Animals. At this point in time, per the United States Department of Justice Civil Rights Division's Disability Rights Section, owners of public places may not insist on proof of state certification before permitting the service animal to accompany a person with a disability into a public space. To qualify as "disabled" under federal disability rights laws, a person must experience limitations to one or more major life activities because of their psychological or physical illness. There are distinct differences between the levels of support animals provide. Psychiatric Service Animals are trained to assist people with psychiatric disabilities including, but not limited to, post-traumatic stress disorder or schizophrenia. Service Animals / Dogs are trained to do work or perform tasks that benefit people with disabilities including, but not limited to, alerting people to potential health situations, safely guiding visually impaired individuals through traffic; pulling wheel chairs and / or fetching dropped items for people with mobility challenges; alerting deaf people to sounds, such as phones and doorbells. They may provide protection or rescue work; or they could function as seizure, diabetes or other medical alert animals / dogs. Service animals require one-and-one, individualized training to perform tasks that are geared to the specific needs of a disabled person. Emotional Support Animals don't require training above and beyond the training any pet receives (or should receive, i.e., toilet training [or "diapers"] and aggression management) to enable them to live peacefully amongst people without being a nuisance or a danger to humans or other animals. Their presence is to reduce the effect of an emotional or mental disability caused by (including, but not limited to) anxiety. They don't necessarily need to be dogs, but could be cats, birds or other animals - in some cases, even rats and reptiles - as long as they are able to perform this function. Rouen Ducks as "Service Animals"
A lizard was classified as an ESA because her owner was allergic to everything else. Individuals allergic to feathers, cats, dogs and other fur could be prescribed a reptile as an ESA, for example, a bearded dragon, eyelash-crested gecko, and others. These animals can also provide comfort and reduce anxiety. Rats have been effectively employed to alert individuals of impending seizures or unusual health attacks. One ESA rat's function was to alert a person in a wheelchair to a health condition by licking the back of its owner's neck. In the United States, any of the above are protected under the Americans with Disabilities Act of 1990 (ADA) and Americans with Disabilities Amendment Act (ADAA). Most other countries observe distinct separations between the different levels of service animals. Air Carriers are required by law to allow the both ESA and service dogs to travel with the passenger in the cabin of an aircraft, as long as the animal doesn't interfere with safety and sanitation on the airline. "Service animals" and "Emotional Support Animals are allowed to relieve themselves in their kennels or carriers. The passenger can hold the animal in her or his lap as opposed to pets being required by some airlines to be kept on the floor under the seat. 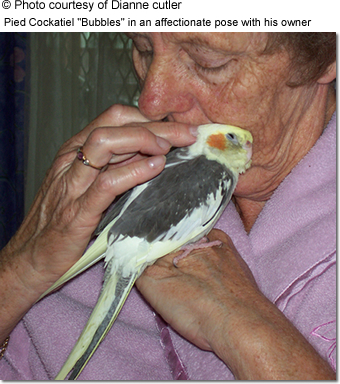 Airlines will accommodate and wave any fees for avian or other prescribed emotional support animals that accompany their owners, as long as appropriate documentation (doctor's letter / prescription) has been provided and the animal doesn't present a danger or interferes with others (such as biting, barking, inappropriate toileting, etc.). The Fair Housing Amendments Act of 1988 (42 USC 3601, et seq.) requires landlords to make allowances for service or emotional support animals. Under federal housing guidelines, landlords or rental complexes are legally required to allow service animals (including Emotional Support Animals) even if they have "no pets" policies in place. In case, where pets are allowed, but are subject to additional charges, such as supplemental rent or pet deposits - these fees must be waived for service animals. However, if a service animal causes any damage to the property, its owner can be charged for the actual damage done by the animal. For more information, please visit the Fair Housing Act / Support Animals page. BeautyOfBirds strives to maintain accurate and up-to-date information; however, mistakes do happen. If you would like to correct or update any of the information, please contact us. THANK YOU!